I mean, I know you're Swedish and all and Swedes have their way of doing things -- like a decent education system and health care for everyone, not to mention your lovely flatpacked self, but really. 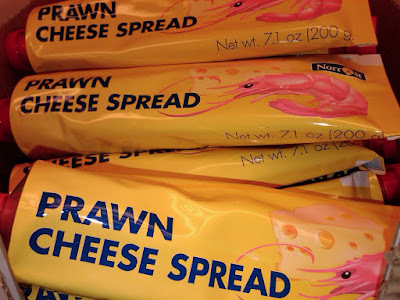 Shrimp AKA Prawns + cheese + tube = WTF???!!!!! As Kara said, when I pix messaged this photo to her, John, Chrissy and Rene, "That's all kinds of wrong." Or to put it more succinctly, as John did, "Ewww." No need to explain. I don't even want to know where this came from. Just get it the hell out of the food stuff section.